Prabhavathi Meppayil’s celebrated work uses the thinnam, a device used by artisans to make patterns on gold bangles. When Marino Auriti created his multi-media sculpture Il Palazzo Enciclopedico, or The Encyclopaedic Palace, in the 1950s, he was aspiring for something grander. The Italian-American artist wanted the 11-foot high architectural model to be realised as a 2,322-foot tall museum in Washington DC that would house all the knowledge of the world – alas, it never was. In 2013, curator Massimiliano Gioni modelled the international exhibition of the 55th Venice Biennale on Auriti’s Palace. Auriti’s idea, Gioni explained in his curatorial note, was to create a repository of accumulated knowledge, starting from the invention of the wheel – an aspiration, he added, that occurs in both the history of art and humanity. In his own encyclopaedic venture, Gioni included works by more than 150 artists from 38 countries, including psychiatrist Carl Jung’s The Red Book. Three of the works in that show were by Bengaluru-based artist Prabhavathi Meppayil. A thinnam is a metallic tool which features widely in Meppayil’s work. It is used by traditional artisans to make patterns on gold bangles and shows up at Meppayil’s show at GallerySKE, where she has a set of five works, each with thinnam on a gesso panel. Meppayil’s works are untitled except for a number assigned to each. The five-piece thinnam work on display at GallerySKE, is called d fifty five. There are at least four recurring ideas in Meppayil’s work at the GallerySKE: the thinnam-imprinted gesso panel; gesso panels with embedded copper and iron wire; gesso coating on found objects, including traditional wooden tools of goldsmiths; and experimentation with the grid. As a result, Meppayil’s panels often lie at the edge of how much authorship the artist can claim and the role of chance, in a work that is extremely technical and demands discipline on the one hand, but where results can be ephemeral. “The colours change during the life of a painting or sculpture, depending on how you choose to look at it,” she said. “The iron rusts and produces this beautiful orange. The copper turns blue. Some years from now, they may corrode and be gone entirely.” Meppayil was looking at d fifty seven, a copper wire and iron wire embedded in gesso panel. Imbued as her work is with local tradition, Meppayil also consciously responds to historical and contemporary art movements around the world. In 2014, London’s Pace Gallery showed Meppayil’s works at an exhibition titled nine seventeen. The accompanying catalogue had a superb essay by Harvard University professor Benjamin HD Buchloch, in which he examined key aspects of Meppayil’s work and how they are more than a throwback to “a summa of postwar strategies, from European and Latin American Neo-Concretism to American Post-Minimalist abstractions”. Buchloch structures his essay in eight parts, to talk about the formal aspects of Meppayil’s work (the white colour, the use of the grid, mark-making as opposed to painting, repetition) and her process. For example, he traces the lineage of her use of white back to the history of white paintings in the 1950s and 1960s, with champions of the non-colour such as Robert Rauschenburg in his White Paintings (1951), Cy Twombly, and Piero Manzoni. Buchloch wonders if the choice of the colour white in Meppayil’s work was so that it could become a space for writing, or get assimilated as architecture. Meppayil loves these in-between spaces, between writing and architecture, mark-making and drawing, sculpture and painting, the artist’s will versus chance elements. Her choice of material, process and form speak of her partiality for duality, ambiguity. “Gesso was used as a surface to paint,” she said. “I am interested in it as an object in itself.” More than anything, Meppayil seems to want to resist categorisation. Her art is at once deeply local and international. 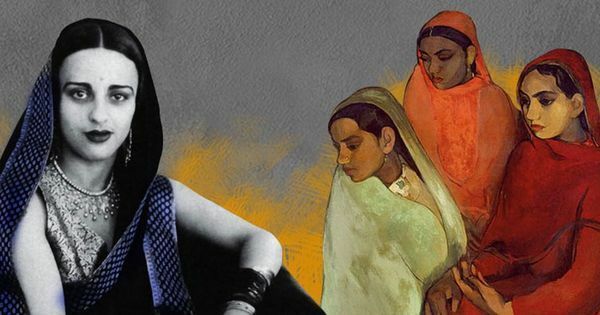 Muse to maker: Who are the women that define Indian art?